by enhancing its unity, efficiency and democratic accountability. Both proposals make use of the EU budget to strengthen the performance and resilience of our interdependent economies. The European Commission has also adopted today a proposal to establish an exchange, assistance and training programme for the protection of the euro against counterfeiting (the ‘Pericles IV programme'), together with a proposal to extend it to non-euro area Member States. What is the Reform Support Programme? The Reform Support Programme is a new instrument designed to foster the implementation of reforms in all EU Member States, starting with priority reforms identified in the European Semester. The Programme will provide financial and technical support for the pursuit and implementation of reforms and to improve Member States' administrative capacity. In addition, targeted support will also be offered to the Member States wishing to join the euro within a defined time-frame, to help them prepare for euro area membership. How is this proposal different from the Structural Reform Support Programme? The Structural Reform Support Programme (SRSP) is an EU programme under the current Multiannual Financial Framework, with a budget of €142.8 million over the years 2017-2020. The programme provides technical support to Member States for the preparation, design and implementation of growth-enhancing reforms and is managed by the Commission's Structural Reform Support Service. The support provided is tailor-made, available to all Member States upon their request, requires no co-financing and mobilises experts from all over Europe and beyond, from both the public and the private sector. The SRSP currently provides support to 24 Member States for more than 290 projects. The overall number of projects supported by the SRSS is over 440. The post-2020 Reform Support Programme will consist of three separate but complementary instruments: the Technical Support Instrument, which will build on the experience and go beyond the current SRSP, and two new instruments, the Reform Delivery Tool and the Convergence Facility. What does the Reform Support Programme include? A Reform Delivery Tool to provide financial support for key reforms identified in the context of the European Semester, with €22 billion available to all Member States. Intense dialogue has taken place in recent months with the Member States on how to develop this new instrument in the future, including by rolling out a pilot project with Portugal. A Technical Support Instrument to help Member States design and implement reforms and to improve their administrative capacity. This builds on the experience of the Structural Reform Support Service which has supported over 440 reform projects in 24 Member States in recent years. The tool is available to all Member States and has a budget of €0.84 billion. A Convergence Facility that will provide dedicated financial and technical support to Member States that have made demonstrable steps towards joining the euro, with €2.16 billion extra available to these countries. This Facility does not alter the criteria in place for accession to the euro but it will provide practical support to ensure a successful transition towards, and participation into, the euro for those Member States wishing to join. What is the overall budget of the Programme? The overall size of the budget of the Programme is €25 billion: €22 billion for the Reform Delivery Tool, €0.84 billion for the Technical Support Instrument and €2.16 billion for the Convergence Facility (including €2 billion for the financial support component and €160 million for technical support). How will the financial support be distributed among the Member States? The new Reform Delivery Tool and the financial support component of the Convergence Facility should provide a financial contribution that is meaningful, i.e. large enough to provide for a sufficient support, but also allowing for a fair distribution of the available amount across the Member States. The allocations that are proposed – through the population key – meet these criteria. On the one hand it ensures that the support that is provided is meaningful - more populous Member States with larger populations can benefit from a higher maximum contribution. At the same time, this distribution also ensures that the maximum net benefit per citizen is the same across all Member States. Why do we need this new instrument? The implementation of reforms is crucial to modernise European economies, enhance resilience of the Member States and of the Union as a whole. The economic and financial crisis showed that our economic and social structures are still vulnerable. While there are other EU financial instruments which can support reforms, they are not specifically intended for promoting the design and implementation of reforms. There is currently also no targeted support for non-euro area Member States wishing to join the euro area. This programme will provide a comprehensive set of tools to support the implementation of reforms in all Member States, which will in turn reinforce the resilience of their economies and serve the process of social and economic convergence among the Member States. How will the Reform Delivery Tool work in practice? The interested Member State will discuss with the Commission possible ideas for reform commitments. The Member State will then propose, as an annex to its National Reform Programmes, to implement reform commitments for one or several reforms identified in the European Semester within a maximum period of three years. The Commission will assess the Member State's proposal and adopt a decision on the reform commitments, determining also the size of the financial support to be awarded. The Member State will then implement the reforms provided for in the reform commitment and will report on progress. This reporting will be done within the European Semester process. The Commission will assess whether the reform has been satisfactorily implemented (whether all milestones and targets have been achieved). If the assessment is positive, the Commission will make the payment. As part of the preparations for the future Reform Delivery Tool, Commission President Jean-Claude Juncker and the Portuguese Prime Minister António Costa agreed in March to launch a pilot project for the new reform delivery tool to address the skills gap in Portugal. This project aims to significantly improve the vocational education and training system in Portugal, addressing the skills challenges of a significant share of the labour force and enhancing the competitiveness of the economy. How does the Technical Support Instrument work in practice? The new Technical Support Instrument will take over and extend the work of the current Structural Reform Support Programme. Member States will request technical support. Member States can submit requests to implement reforms in the context of the economic governance process, notably related to country-specific recommendations issued under the European Semester, but can also request support concerning the implementation of Union law or actions to implement reforms at Member States' own initiatives. The support provided is tailor-made to address Member States' specific needs. It requires no co-financing and aims to strengthen the capacity of Member States to prepare, design and implement reforms. The technical support on the ground can be provided directly through the Commission's in-house expertise and/or through other providers of technical support. How does the Convergence Facility work in practice? The Convergence Facility is meant for non-euro area Member States wishing to join the euro and taken demonstrable steps towards adopting the euro within a defined timeframe. Demonstrable steps would consist of a formal letter from the government of the Member State to the Commission stating its clear commitment to join the euro area within a reasonable and defined timeframe. The Member State also hast to present a credible time-bound roadmap, after consultation with the Commission, for implementing concrete measures to prepare for successful participation in the euro area. This would include steps to ensure full alignment of its national legislation with the requirements under Union law (including the Banking Union). The proposals for financial support or the request for technical support under the Convergence Facility will follow similar procedures as the Reform Delivery Tool and the Technical Support Instrument. The reforms to be supported should be geared towards preparation of euro area membership. When and how can Member States apply for the Reform Support Programme? The entry into force of the Reform Support Programme depends on its adoption by the co-legislators and also on the adoption of the new Multiannual Financial Framework 2021-2027. After the adoption of the legislative proposal, Member States will be able to apply for support as of January 2021. For the Reform Delivery Tool, the allocation of funds to the Member States will be made in stages. o 50% of the total size of the financial envelope (€11 billion) will be allocated in the first twenty months from the entry into force of the Regulation establishing the Programme, during which Member States can submit proposals for reform commitments and can receive up to their maximum allocation depending on the nature and importance of the reforms. The maximum allocation per Member State is determined depending of its share of the total EU population. o In the second stage, which lasts for the remaining period of the Programme, the Commission will allocate the remaining 50% of the overall envelope (€11 billion), plus the amount that has not been used by the Member States in the first stage, through a system of periodic calls. Under each call of this second stage, Member States will be invited to submit reform proposals concurrently, and they could be awarded their maximum financial contribution on the basis of their reform proposals under each call. For the Technical Support Instrument, the Commission will organise calls for submission of requests and ensure equal treatment of all requests. Proposals for financial support or requests for technical support under the Convergence Facility will follow similar procedures as the Reform Delivery Tool and the Technical Support Instrument. The reforms to be supported should be geared towards preparation of euro-area membership. What are the main features of the European Investment Stabilisation Function? The EU budget would guarantee back-to-back loans of up to €30 billion. The loans would be available to Member States experiencing a large asymmetric shock and complying with strict eligibility criteria for sound fiscal and macroeconomic policies. The support should be used to maintain public investment levels. Member States would also be granted an interest rate subsidy to cover the costs of the loan. This subsidy will be funded from contributions from Member States equivalent to a share of their monetary income from the assets they hold in exchange of the banknotes they supply (commonly known as "seigniorage") and collected through a Stabilisation Support Fund. The revenues of this Fund will be assigned to the EU budget to provide the interest rate subsidies to the eligible Member States. Such interest rate subsidy is important to make the instrument financially meaningful. 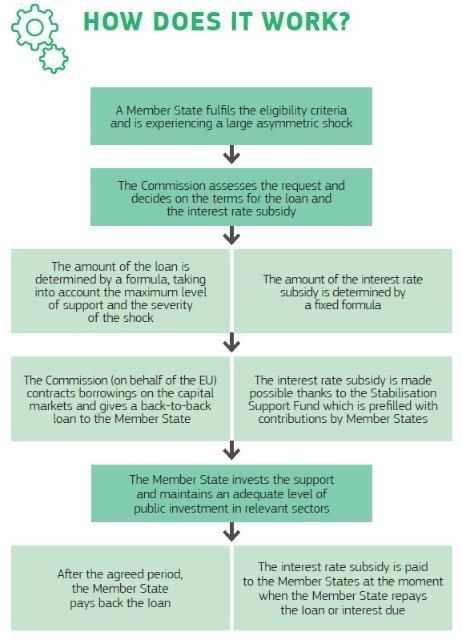 As set out in December 2017, this stabilisation function can be complemented over time by additional financing resources outside the EU budget, such as a possible role for the European Stability Mechanism or the future European Monetary Fund, and a possible voluntary insurance mechanism to be set up by the Member States. The future Stabilisation Support Fund can also be a vehicle in this context. Why do we need a European Investment Stabilisation Function? What is the value added? The financial crisis highlighted the limitations that individual euro area Member States have to absorb large asymmetric shocks, even with sound public finances going into the crisis. Some Member States even lost access to market financing and had to request financial assistance. A European stabilisation function would provide the possibility to activate resources rapidly at EU level to deal with shocks that cannot be managed at the national level alone. Such a function would help soften the effects of asymmetric shocks and prevent the risk of escalation and negative spillovers to other Member States. The new Function will complement the toolbox existing at national and European level to prevent crises from emerging on the one hand, including through the European Semester and corresponding EU funding, and to deal with situations of financial distress, through the European Stability Mechanism and Balance of Payments assistance, on the other. The European Investment Stabilisation Function is necessary for two main reasons. First, Member States that share the euro or are part of the exchange rate mechanism ERM II, cannot use exchange rate and monetary policies as a way of adjusting to asymmetric shocks. Second, the current incomplete architecture of the euro area with a centralised monetary policy but decentralised national fiscal policies can put a very high burden on national public finances. As experienced in the crisis, this can considerably reduce Member States' capacity to use fiscal policy to react to large asymmetric shocks. This new instrument is specifically directed at supporting the beneficiary Member State's public investment, which is often one of the first budget items that is cut in crises. However, a decrease in public investment has long-lasting consequences on the Member State's economic growth and its ability to recover from the shock. Supporting public investment will thus help a Member State absorb the shock and facilitate a more rapid and stronger economic recovery. The Commission proposed strict eligibility criteria to avoid moral hazard and create an additional incentive to pursue sound fiscal and structural policies. Only Member States that comply with fiscal and macroeconomic surveillance rules in the two years prior to requesting support are eligible to benefit from the European Investment Stabilisation Function. This means, that Member States should be compliant with the different surveillance strands (Stability and Growth Pact and Macroeconomic Imbalances Procedure). When do we consider that a Member State is experiencing a large asymmetric shock? What are the activation criteria? In a crisis, a Member State can lose access to financial markets and require a fully-fledged programme with financial assistance from the European Stability Mechanism or a Balance of Payments programme. However, a Member State may experience a large asymmetric shock, without necessarily losing market access. Until now, there has been a gap in the policy instruments toolbox for such situations. The European Investment Stabilisation Function fills that gap. It is an instrument that acts between small shocks, which can be dealt with by national policy (in particular fiscal policy) and a crisis. One of the aims of the new tool is precisely to prevent such a crisis situation and limit the impact of shocks. Significant increases in national unemployment rates above their long-term averages are a clear indicator of the impact of a large shock in a specific country. Therefore, the Commission proposes to measure large asymmetric shocks affecting Member States by a double trigger criteria which have to be fulfilled simultaneously: (i) its quarterly national unemployment rate exceeds the average unemployment rate in the Member State concerned measured over a period of 60 quarters (15 years) preceding the quarter during which the request was made; (ii) the quarterly unemployment rate increases by one percentage point above the unemployment rate observed in the same quarter of the previous year. What is the Stabilisation Support Fund and how is it financed? The Stabilisation Support Fund will be created to finance the interest rate subsidy, thereby further reducing the costs of the European Investment Stabilisation Function loan. The Fund will be filled with national contributions from Member States. The method for calculating these contributions and the rules regarding their transfer to the Fund will be established by an intergovernmental agreement. According to the Commission proposal, euro area Member States would contribute the equivalent of 6% of the amount of the monetary income allocated to its national central bank at the end of the preceding financial year. Member States participating in the exchange rate mechanism ERM II would make an annual contribution equivalent to 6% of the monetary income of the Eurosystem weighted by that Member State's GDP share in euro area GDP. The Stabilisation Support Fund ensures that the resources to subsidise the interest payments are available when needed, without involving lengthy decision-making and fund-raising procedures. The unused part of the Fund's endowment will not be kept idle but rather prudently invested in liquid assets that yield returns. The Fund will be set up outside the EU budget but administered by the Commission in accordance with the European Investment Stabilisation Fund Regulation and its delegated acts. The contributions to the Fund represent external assigned revenue for the EU budget. How would the European Investment Stabilisation Function work in practice? 1. A Member State would be able to request support from the European Investment Stabilisation Function once a year. The Member State would indicate its need for support. 2. After having verified that the Member State fulfils the eligibility criteria and is experiencing a large asymmetric shock, the Commission would then assess and respond to the request in the order it receives them. The Commission would decide on the terms for the loan such as the amount, average maturity (paying back of the loan), pricing formula and availability period. It would also decide about the size of the interest rate subsidy. 3. The amounts of the loan support and the interest rate subsidy would be determined by pre-defined formulas. As regards the loan component, the amount would be determined by taking into account the maximum level of eligible public investment that can be supported and the severity of the shock. Interest rate subsidies would cover 100 percent of the interest cost incurred on the loans. 4. For the loan, the Commission (on behalf of the EU) would contract borrowings on the capital markets or from financial institutions. The borrowings contracted by the Commission are back-to-back, meaning that the Commission borrows from the market and lends the resources to the Member State at the same conditions as it obtained on the market. The EU budget serves as a guarantee for the amount borrowed. The loan is disbursed to the Member State in principle in one instalment. 5. Resources for the interest rate subsidy will be collected through the Stabilisation Support Fund and become externally assigned revenue for the EU budget. The contributions by Member States will be determined in accordance with an intergovernmental agreement which determines the method for calculating them and the rules regarding their transfer. The interest rate subsidy will be paid to the Member State concerned at the moment when the Member State repays the loan or interest due. 6. The Member State would have to invest an amount corresponding to at least the amount of the loan in eligible public investment, and maintain the same level of its public investment compared to the average level of its public investment in the five previous years. The year following the disbursement, the Commission would examine if the Member State has respected these conditions. In case of non-compliance, the Commission could request the early repayment of whole or part of the loan, and decide that upon repayment of the loan the Member State concerned shall not be entitled to receive the interest rate subsidy. 7. After the agreed period, the Member State pays back the loan to a special account of the Commission. 8. The Commission pays back the amount borrowed to the capital markets/financial institutions. How do these new tools fit into the overall picture EU's economic policy coordination and funding instruments? These instruments are complementary to, and will work in full synergy, with the reform priorities identified in the context of the European Semester of economic policy coordination, as well as other EU funding instruments for jobs, growth and investment, such as the European Structural and Investment Funds, the new InvestEU Fund and the Connecting Europe Facility. What is the Pericles programme and what is the Commission proposing to protect the euro against counterfeiting? Pericles is a programme funded from the EU budget with the aim of preventing and combatting euro-counterfeiting. It provides training and technical assistance for competent national authorities to enable them to further improve the protection of euro banknotes and coins. It is therefore directly linked to the Commission's objective of improving the functioning of the Economic and Monetary Union. The Pericles 2020 programme was set up under the current Multiannual Financial Framework, for the period between 1 January 2014 and 31 December 2020, with a little more than € 7.3 million for its implementation. Today, the European Commission has proposed the continuation of Pericles under the next Multiannual Financial Framework, with €7.7 million dedicated to it over seven years. This is necessary as the threats of euro-counterfeiting are still substantial, demonstrated by the increasing availability of high quality counterfeit euros and security features on the dark web and the existence of counterfeiting hotspots. Counterfeits harm citizens and businesses that are not reimbursed for counterfeits. As for past Pericles programmes, the Commission proposes to extend the programme to Member States not yet using the euro as their currency in order to ensure the same level of protection for the euro in all Member States. Today's proposals build on the results of the mid-term review published in December 2017, which concluded that the programme has had direct tangible influence on protecting the euro and it demonstrated clear added value in a field that can only be tackled efficiently at EU level. The protection of the European single currency as a public good, used by 19 EU Member States and beyond, has a clear transnational dimension. Pericles would continue to promote transnational and cross-border cooperation within the EU as well as internationally, ensuring a global protection of the euro against counterfeiting.